In the lead-in to IBC, Wi-Fi Mesh solution provider AirTies has announced a strategic partnership with DOTSCREEN, a UI specialist and multi-screen app developer, to integrate its UI into AirTies’ 4K/UHD IP set-top boxes. These include the Air 7415 and the Air 7430, both of which will be demo’d on AirTies’s IBC stand. The Air 7415 integrates popular OTT applications such as YouTube, Google Cast, voice controls, and games, and offers UHD, HDR and SDR-HDR conversion. It can connect wirelessly over Wi-Fi or Bluetooth to simplify installation on the home network. The Air 7430 offers the 7415’s functionality, but doubles as both a 4K STB and Mesh Extender, improving Wi-Fi performance for nearby smartphones, tablets, and other connected devices. It also supports AirTies’ Remote Manager, a cloud-based Wi-Fi optimization software suite that provides key in-home Wi-Fi performance data and analytics to improve the consumer experience. Both STBs are designed to appeal to customers seeking a turnkey solution for Android TV or Linux/HTML-5. AirTies says its mesh technology powers more than 25 million homes worldwide. 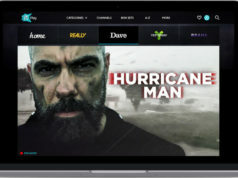 DOTSCREEN, meanwhile, develops and licenses multiscreen video applications for connected devices such as Smart TVs, OTT boxes, STBs, game consoles, HbbTV, smartphones, tablets, and smart speakers.